The tick population in Nova Scotia is growing. With the growth in population, there is also an increase in the number of tick-bourne diseases reported. Lyme disease is transmitted to animal (including humans, dogs, and cats) whey they are bitten by a tick that is infected with the disease. Lyme disease is a bacterial infection caused by the bacteria Borrelia burgdorferi which is transmitted by infected black-legged ticks. The disease has a number of symptoms, including muscle and joint pain (resulting in lameness or reluctance to move), and lethargy or fatigue. Dogs are less likely to show symptoms than humans, so Lyme disease is more often detected in humans than dogs. In humans, a “bull’s eye” rash is one of the most common symptoms. Avoid long grass and scrubby areas, especially in areas where Lyme disease is know to exist. Ticks wait on tall plant and transfer to animals when they brush past. Avoiding ticks is the best way to prevent bites. Check you and your pets for ticks after going outside. Ticks will not always bite right away. They way wander around the host looking for the best place to bite. Finding them before they bite will prevent the transmission of disease. Remove ticks as soon as you find them. Wash the bite with soap and water. It can take the tick up to 24 hours after biting to transmit disease, so immediate removal will decrease the risk of disease. Use forceps or tweezers to remove the tick. Firmly grasp the tick as close to the skin as possible and pull out fo the skin in the direct of the ticks body. You want to remove all of the tick; buried mouth parts may break off if not pulled straight out. Do not burn or smother the tick to remove it. Distressed ticks may regurgitate into the host, increasing the risk of disease transmission. Consider a tick prevention product. Be sure to read the label carefully before using a product: some products are poisonous to pets, especially cats. Also, some products will not kill the tick until it bites, so you may still see some ticks crawling around. Consider Lyme disease vaccination. If you are in an area that is at high risk for Lyme Disease, vaccination can help prevent illness. There are several different species of tick. Here are a few of the more common. When trying to identify ticks, it is important to be aware that nymphs (teenage ticks) are smaller than adult ticks, and that ticks become larger when engorged (full of a blood meal). Ticks can also change colour when engorged. https://www.petsandticks.com/ is a great resource for identifying ticks found on companion animals. This website is provided by the parasitologists at the Ontario Vet College and the Atlantic Vet College. You can also submit ticks for identification. American Dog Tick, or Wood Tick (Dermacentor variabilis) This tick is one of the most commonly found in Nova Scotia. It is found throughout most of North America. While the wood tick can carry Rocky Mountain Spotted Fever (a disease mostly found in the Rocky Mountains), it does not carry Lyme disease. This means that anyone (human or dog) bitten by a wood tick can not get Lyme disease. The photo to the right is a wood tick viewed through a microscope. Brown Dog Tick (Rhipicephalus sanguineus) The brown dog tick population in Nova Scotia is believed to be smaller than that of the American dog tick or the black-legged tick. 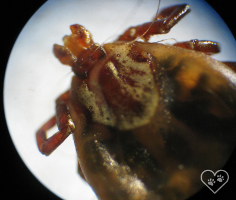 However, the brown dog tick is unique amount tick species; it have live its entire life indoors. Like fleas, brown dog ticks are capable of infesting your house: an excellent reason to check yourself and our pets every time you go inside. Black-legged Tick, or Deer Tick (Ixodes scapularis) The black-legged tick is capable of transmitting Lyme disease. However, not all black-legged ticks are infected with Lyme disease. Only an infected black-legged tick can transmit Lyme disease, so being bitten by a black-legged tick does not always mean that you or your pet have been infected. Despite the name, not all black-legged ticks have black legs. 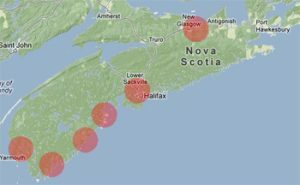 The image to the right (from novascotia.ca/dhw/cdpc/lyme.asp) shows areas in Nova Scotia where black-legged ticks with Lyme disease are know to be found. However, it is possible for infected ticks to be found outside these areas as the disease spreads.